The Beirut International Property Fair, is a fair dedicated to transforming Beirut into an International Hub for the Real Estate Industry of the region. The Fair is the first of its kind in Lebanon in terms of professionalism and quality; they target Professionals from different aspects of the industry, from Beirut as well regional countries & the GCC. 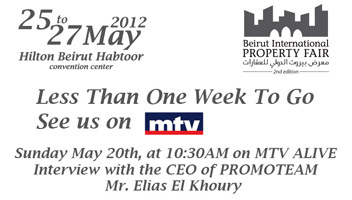 Architects, real estate and contracting companies were cordially invited to the 2nd Edition of the Beirut International Property Fair that was held on Friday May 25th, 2012 and continued until the 27th of May, 2012, at the Hilton Beirut Habtoor Hotel. Dana Agency was there to promote their online marketing plans and their social media solutions.